What do aromatherapists do when they catch a cold? I mean, aside than writing about it when I should be resting! To be honest, I don’t even know how I caught this cold ( I don’t like to even admit it!!). I use essential oils on a regular basis that support my immune system, and take other measures. But I am human after all. Of course, there’s the usual things everyone should do, like drink lots of fluids, get lots of rest. I decided to set up camp on the couch with a couple great books*, drink tea, journal, and let my mind wander. I picked out one of the new mugs I made (the owl mug in the photo) and filled the tea kettle for a day of reading and tea drinking. One thing I do when something goes wrong is to use it as a learning experience – and an experiment to see what works, so I can use that knowledge to help more people in the future. I made a nasal inhaler/aroma-stick for congestion and sinus headaches with rosemary, lavender, eucalyptus, and frankincense, and used it religiously. This really helped, throughout the week. Each of these essential oils can help with congestion (eucalyptus especially – but just a side note, it shouldn’t be used with young children) and in general can support the respiratory system. They have anti-microbial properties and can support the immune system. I decided to experiment with hydrosols for the swollen feeling in my throat. Hydrosols have a very low percentage of plant material and are safe for internal use! One should always be aware of potential safety precautions though, even with hydrosols. I tried a glass of water with a tablespoon of peppermint hydrosol, but didn’t feel much difference (however, it was mentally stimulating and suddenly I felt more awake). Then I tried a glass of water with a tablespoon of cornflower hydrosol. Some improvement, but it didn’t seem to last long. It’s an essential oil distilled from the dried fruit of xanthoxylum from Nepal (Aromatics international carries it). It has a deep, sweet, fruity, and slightly floral aroma. It has been said to improve voice quality if used over time ( I don’t know if this has been confirmed but is anecdotal), so with this and other benefits, I thought it would be fitting for the throat area. I had also thought about using copaiba for its respiratory support properties, but the blend was already at 7% dilution which was high enough in my opinion. Most blends are sufficient at 2% dilution (which in this case would have been 2 total drops). I massaged this blend onto my throat and felt some improvement in the swollen sensation, that lasted longer than the results of the hydrosol experiment. One great thing about essential oils (and hydrosols!) is that you can make one blend that addresses several issues and help different aspects of the individual! Normally when I am blending for other people it’s a longer, more thorough process of considering different applications (inhaler, massage blend, bath salt, etc), listing a lot of potential oils and choosing from those, considering individual contraindications, lifestyle and needs, and tuning in my intuition. In the case of this blend, I didn’t want to spend a lot of time since I needed it right away, and had limited energy. The more I learn about these essential oils, get familiar with them, and build a relationship with each of them, the easier it is to quickly make an effective blend! It’s also a great skill to be able to make something “on the fly”. One day this week I also ran a diffuser with copaiba (respiratory support, immune system support), douglas fir (anti-microbial support, uplifting) and wild orange (anti-microbial support, immune system support, uplifting). One thing I almost always recommend for colds that I really should have done is a steam inhalation, where I add a drop of essential oil to a bowl of steaming water, drape a towel over my head, and inhale the vapors (with my eyes closed). 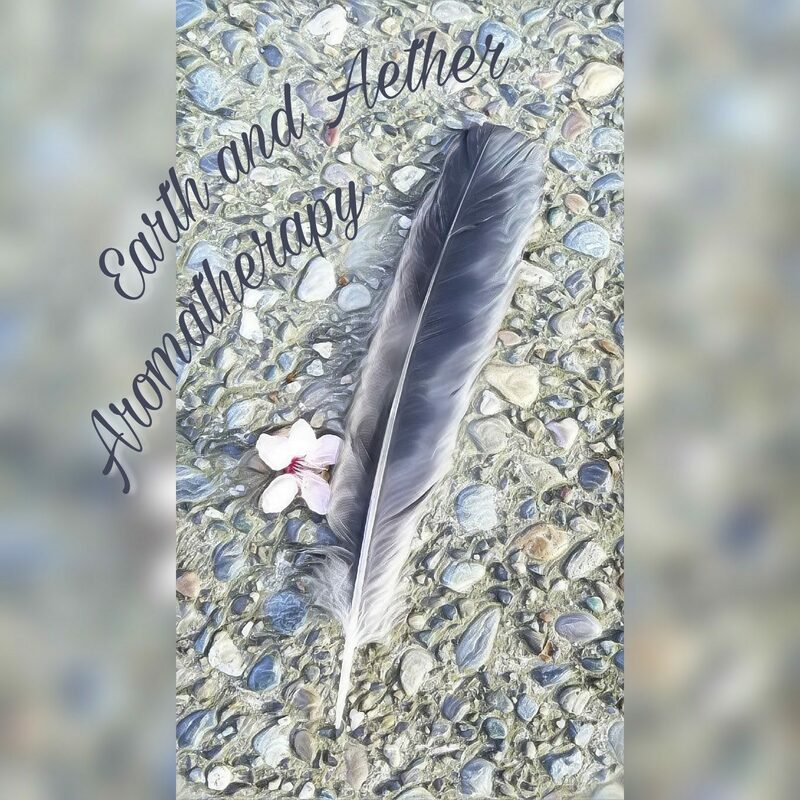 *I read a little from Gabriel Mojay’s “Aromatherapy for Healing the Spirit”, read about the moon phases in Llewellyn’s Moon Sign Datebook, and read some of Laura Tempest Zakroff’s new book “Sigil Witchery“. The information from this website are not a replacement for medical or psychological care and should not be considered an alternative to the advice of a health professional. Do not use information obtained fromhttp://www.earthandaetheraromatherapy.net to ignore or disregard health professionals’ advice. I am a certified aromatherapist, but I am not a licensed medical professional. I do not diagnose, treat, prescribe, or promise to prevent or cure any medical condition or disease. These statements have not been evaluated or approved by the FDA. If you “favorite” my shop, you’ll get notifications when I list new items! If you are a new customer to Aromatics International and you use my referral link http://rwrd.io/48hicml to order $100+ in aromatics and/or supplies, we both get $15 shop credit! Also, now they have a rewards points system with multiple ways to earn!